Whilst writing about spiders it reminded me of an embarrassing mistake in 2012. Croome Park is known as a good spot for dragonflies and other invertebrates but in June 2012 I discovered something that I thought would trump anything previously found at the site. 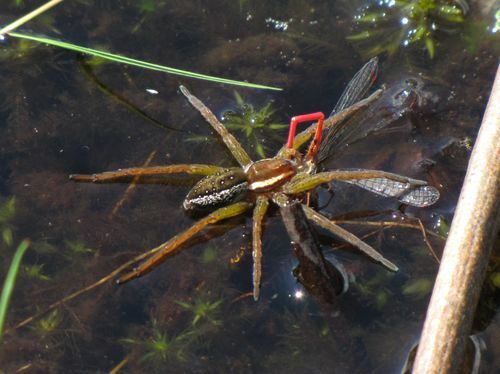 Whilst crouching at the side of the lake looking for dragonflies I noticed a spider walking on the lake. It moved with ease and came close to the bank but stayed on top of the water. 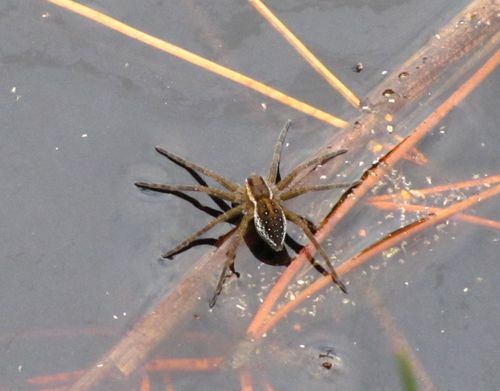 It was dark brown with pale lines along the sides of its body; it had to be a juvenile Raft Spider Dolomedes. I managed to get a couple of reference photographs and on returning home I emailed these to John Partridge with a comment about what I thought I had found. 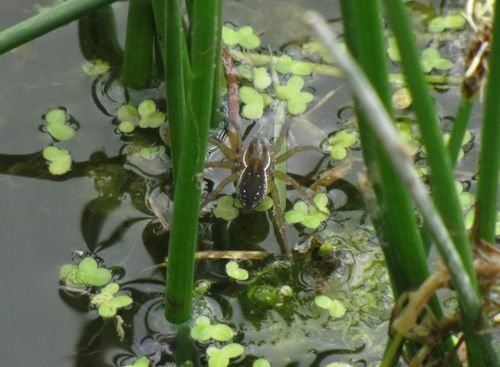 As soon as I had sent the pictures I checked through my books again and in Stephen Dalton’s Spiders, The Ultimate Predators I found a picture of ‘my’ spider: not a Raft Spider at all but a Pirate Wolf Spider Pirata piraticus. A second email was sent to John Partridge in a hurry, but too late, he had already spotted my error. The similarity between juvenile Dolomedes and this species of Pirata is remarkable and presumably the result of convergent evolution (that’s my excuse anyway). 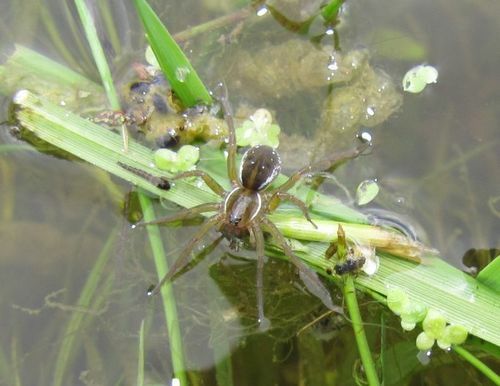 Two pictures show the Croome spider Wolf Spider Pirata piraticus (01 & 02) and two show the Raft Spider Dolomedes (03 & 04).